#1 – Has this speaker actually done it? YES! From the front lines to the executive level, Manley’s business leadership experience has driven real world results! – Helping grow global business revenues 862% and land on the Fortune 100 Best Companies to Work For, combined with mountain climbing adventures around the world has yielded insights and frameworks that you can implement immediately. #2 – What good is information if you are not inspired to implement it? Manley balances actionable content with authentic inspiration so your audience actually takes action to drive real ROI from your event. – Expect your attendees to walk out equipped with rock solid content, fired up and motivated to drive breakthrough results. #3 – Is this speaker relevant and engaging? Expect your audience to be on the edge of their seats, completely captivated, writing notes and deeply committed to taking action. – When they get back to work, they will know exactly what they need to do to increase productivity and profits in their organization. 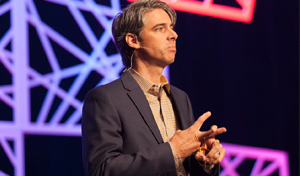 You and your audience deserve more from speakers, especially when you invest in a full time professional keynote speaker like Manley. Starting with his first paid speaking engagement in 1995, he has relentlessly pursued excellence on the platform and it will show. Call 314-724-3443 today to find out how he can help you reach Your Next Summit! 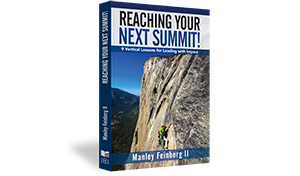 Manley is an inspirational leader and speaker that will leave your audience believing that they can accomplish anything including climbing a mountain! 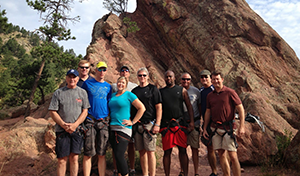 He utilizes his real world adventures as metaphors to solve a broad array of challenges in the workplace.